It's here! Spotify for iOS4 with background listening. It’s here! Spotify for iOS4 with background listening. I can’t tell how excited I’ve personally been about this update Checking iTunes rampantly as if my life depended on it. Finally, Spotify, the greatest contender to the iTunes music throne supports iOS 4 and background listening. Apple has had its hands on the update for a few days and you’d be forgiven for thinking Apple was intentionally delaying its release…but alas, it’s here. When Spotify announced it had submitted its app, it mentioned there’d be a little surprise that would make the mobile app even “more exciting.” Well that little something is all the goodness of desktop music sharing but on your mobile. The app also now shows you newly released albums, 100 top tracks in your country and also includes your Spotify social feed. The new release also makes using the headset remote and lockscreen buttons to control playback on Spotify. That’s going to be very helpful. 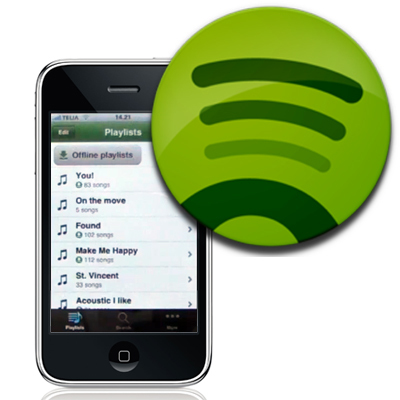 Spotify is still currently only available in Sweden, Norway, Finland, the UK, France, Spain and the Netherlands. Plans to expand into the US are rumoured to begin in the third quarter of this year. Download here or check your itunes updates. The app is only available for the 3GS, iPhone 4 and third generation iPod Touch. Read next: That Steve Jobs Email Transcript with the Furious iPhone Customer? FAKE.